Hello Friends – looooong time no chat! I have missed corresponding with many of you. The truth is, life has taken an even busier turn with the holidays and all that goes with them. I have been sewing like crazy for my 2017 projects. It’s crazy to share this — we haven’t even had Christmas 2016, but I am already working on Christmas 2017 stuff. I actually have quite a few Christmas 2017 things already in the works, much more than years past. 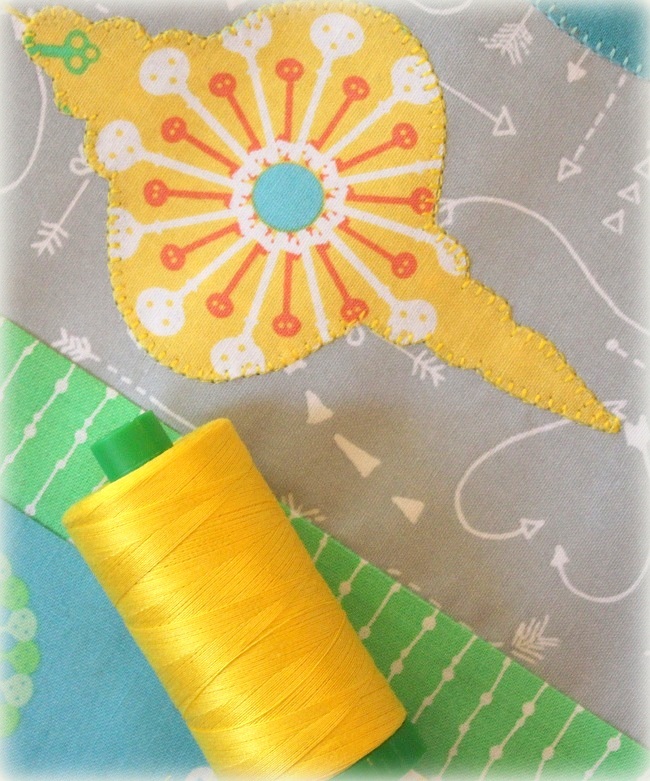 Today is my turn on Windham Fabrics’ Curious Dream Blog Hop. I never turn down a chance to participate in a blog hop because that means I get the opportunity doing something fun and different — even if I am up to my eyeballs in deadlines! Curious Dream fun fabric group by Angela Pingel, based on Alice in Wonderland. The fabrics are adorable. Click here to view the entire fabric collection. Since Christmas is really big in our house (especially for a certain little girl), I used these fabrics to make a Christmas pillow. ANYTHING is possible in Alice’s Wonderland, right? :) Even if that means pulling off a Christmas pillow from non-Christmasy fabrics! 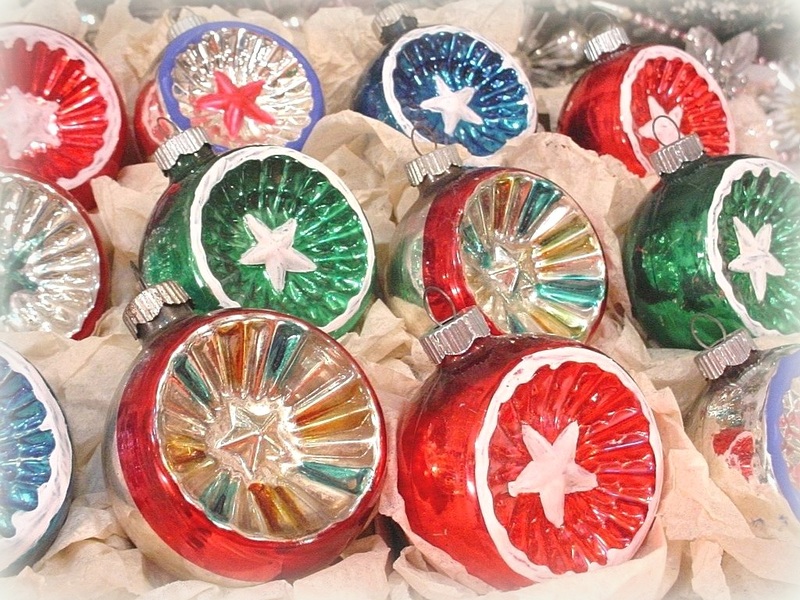 Remember the Old World blown glass bauble Christmas ornaments? I have a soft spot for them even though I don’t have any. Curious Dreams has three different fabrics that feature medallion motifs made of keys, which I fussy cut to fit the ornament templates, found online, as the starting point for my fabric bauble ornaments. You can click here to print these ornament templates. Before I fused my applique pieces, I measured and marked where I wanted my hanging ribbon to be. I used Aurifil 40wt to stitch the straight lines. The heavier wt meant I only have to stitch along the paths 3 times to get the hanging ribbon effect. I do not like my applique piece to have raw edges in view. So, I always finish them with buttonhole stitches when I am doing fusible machine applique. This is my first time using the heavier Aurifil 40wt (compared to 50wt) for the buttonhole stitches. I have to say I like the effect for these ornaments! For this particular ornament, I thought that the buttonhole stitches would detract from the look. So, I outline-stitched around the ornament three times, also with a 40wt thread, and I REALLY REALLY like the result! To finish off the hanging ornaments, I used embroidery floss from my Marmalade Meadows collection to make bows that were then secured to the pillow top by hand. Click here if you haven’t heard of my Marmalade Meadows floss collection. I will share more about this collection next week with a few juicy details! Stay tuned. The hanging ornament section was then pieced with two other fabrics to make my pillowcase! I kept the other sections simple so that the focus will be on the ornaments. #1. Click on Windham Fabrics’ blog post HERE for chance to win FQ bundle — this giveaway is open to the USA and International quilters! #2. 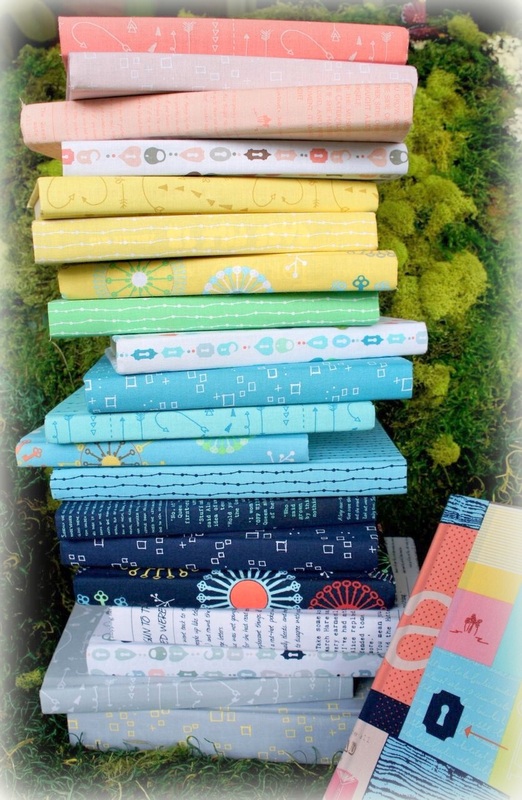 Between now and Dec 22, leave a comment on this post for an extra chance to win a FQ Bundle within Continental US, and I will announce winner on Dec 23. That’s it for now, Friends! I hope to share with you before the weekend a few (like 4!) magazine quilts that are made with Windham’s fabrics!! Till then. This entry was posted in Ideas and tagged Angela Pingel, Blog Hop, Christmas Ornament Pillow, Wendy Sheppard Designs, Windham Curious Dream. Bookmark the permalink. 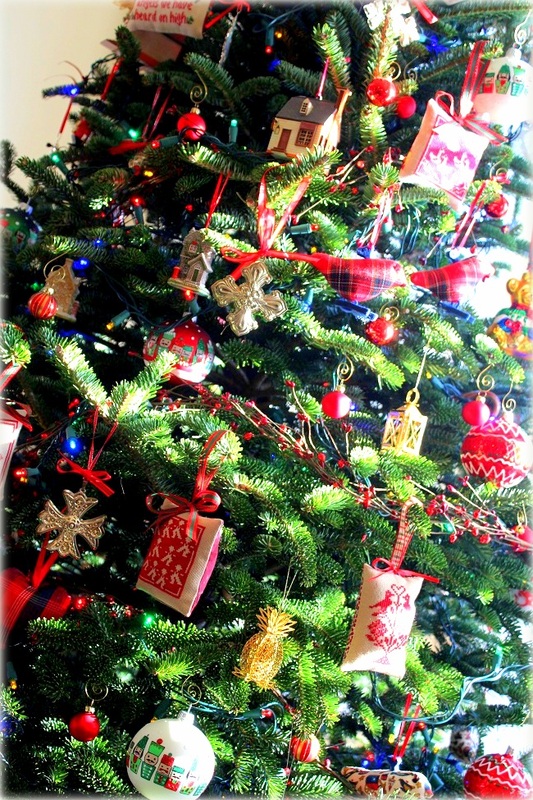 Love your Christmas tree decorations as well as the lovely pillow! I agree, the 40 wt thread really pops on the appliques. Marmalade looks yummy!! I never would have connected the fact that the medallions looked like ornaments. What a wonderful idea. Your stitching really enhanced the effect. Wendy, you have the most talented and creative spirit I’ve seen. And those fabrics are gorgeous! Thanks for the help with the link! Thanks, and love the fabrics! Oh Fun. Love how you created a holiday feeling with those cut outs!!!! I like your new pillow! Nicely done. The Windham link isn’t working for me either! I am not a lover of the ‘Holiday’ fabrics, which it probably why working with them makes me shiver. Making use of fun prints to make these cute ornaments, genious! Very clever how you turned the fabric into ornaments! Love the fabrics. Would love to win these fabrics! Love the ornaments and L O V E this line. The ornaments work perfectly and do have the look of the antique ones. Thanks for the chance to win! What a fun post. 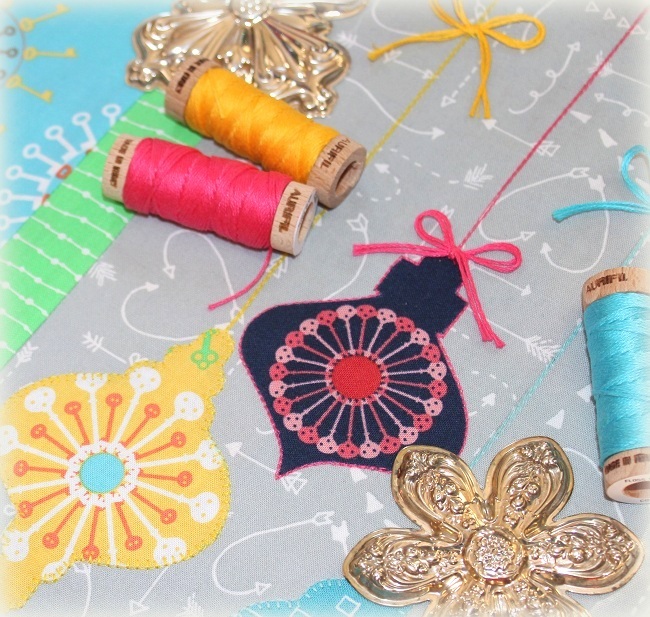 Love all your tips for machine applique’. You definitely look ready for Christmas and that pillow looks so sweet, I’m sure Miss Baby will enjoy it in Christmas Dreamland. So pretty to use non-traditional fabrics in a Christmas-y theme. JUST ADORABLE! THANKS TO YOU+WINDHAM FOR A BEAUTIFUL GIVEAWAY! I like to use 40 wt thread for applique too. Because I am a machine embroiderer I have quite a good stash to choose from. Good Morning Wendy! The pillow is lovely! I especially like the added embroidery stitches, they always add that extra special touch of love (in my opinion). Yet, that could be because I have always enjoyed hand embroidery, both my Grandmothers taught me. I still have quite a few gifts to make and will be adding some touches of embroidery also. I would love to win a bundle of this great fabric! Thank you for the opportunity! Have a fantastic creative day! I love the way you fussy cut the ornaments. You have such a good eye for design. Wonderful idea and use of the fabrics! Wow, Wendy, what a creative way to use the fabric as a center for the ornaments. I love it! When I was a kid, our tree was full of those ornaments. Slowly, one by one, they broke. I do still have the tree topper, which we don’t use on our tree currently, but I do take it out of the box each year just to look at it. Happy Holidays! I love your ornaments! I also love that you saw Christmas in these fabrics! Leave it to you, Wendy, to do something creative and unexpected with that pretty fabric! Those are so nicely applique’d I really love the fabric. Your tree looks perfectly decorated and I love the fabric covered books. Fabrics are fantastic! Thanks for sharing them with us. These are such pretty fabrics, and your pattern highlights that, but it would be really charming for so many other styles as well–I’m already thinking of very traditional Christmas reds, greens, and golds for my sister-in-law. Thanks for your generosity in sharing. I love the old fashioned ornaments, also. Many happy memories associated with family tree trimming parties. Such sweet fabric and you were very clever to use it to make bauble ornaments. Saw Dan last week and he said tell you HI!!!! Rhonda wasn’t in the shop yet. Oh my gosh – the ornaments are gorgeous – so lovely and so nicely done!!! WOW – I would like to try this!!!! What a fun pillow Wendy! I love the old ornaments too. Merry Christmas! 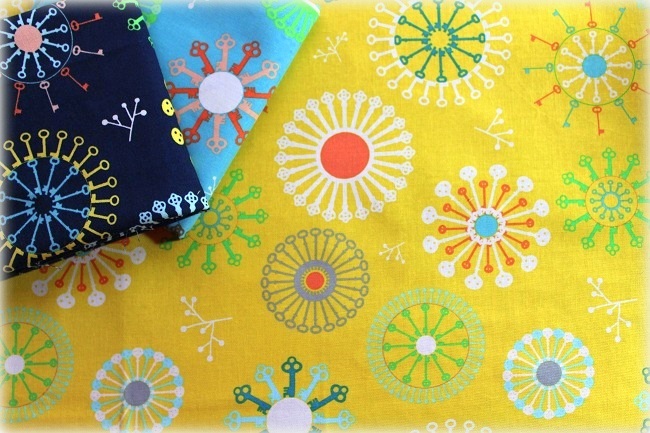 Love these fabrics and what you made with them! Thank you for sharing your project. The fabrics are delightful. I have been collecting Alice in Wonderland fabric over the years to make something special. These new designs add a whole new dimension. I love your creativity and whimsy in all you do. Thank you for the give-away, and the details of them lovely Christmas ornament quilt. Wonderful fabrics! Love your Christmas Ornament pillow. Thanks for sharing the details of your embroidery. I love the ornaments and I am old enough that if I find the right box I’m sure I have some somewhere. Great fabric and beautiful projects! Your “Ornament” pillow is very, very pretty….it made me very nostalgic for Christmas trees of my childhood….that box of ornaments looks like the ones my quilting grandmother used to have. How I wish I had the foresight to keep things like those after she passed. Thank you for the lovely memory. It’s so good to hear from you…glad all is well….don’t get too busy to really enjoy life and family. Merry Christmas….may 2017 be your BEST year yet…full of peace, love and prosperity. Love the fabrics and the projects. I love your Ornament pillow. The applique really made the fabric pop beautifully. Wonderful post for this time of the year. Happy holidays and thank you for the giveaway opportunity. You are so sew busy, first time here and just blown away with how much you create. Thank you for going into detail about how you sewed on the ornaments, just love it and your Marmalade Meadows floss is now at the top of my wish list. Really like the way you sewed down the ornaments, looks so nice. Fabric is fun & would love to make a project with the fabric. Sweet project! Thanks for sharing. You are so clever! I love how you fussy cut the fabric into beautiful ornaments. your creations are awesome! T^Hank you. And the threads are beautiful! Your pillow is really cool! Thanks for the giveaway. Lovely fabric and great work! Your talent is just amazing. How clever. Don’t know how you find time to dream all this stuff up. Is Miss Baby rearranging the ornaments on the tree again this year? I love that you appliqued the ornaments. A wonderful touch. Best of the new year to you and yours. That outlining really does look nice. The pillow is beautiful! I love the way you fussy cut the fabric for the ornaments, and I was particularly drawn to the way you stitched a straight stitch around the black ornament! Very striking. Thank you for sharing. Your ornaments are so cute! I love the pillow. You have a great imagination, Wendy. Those ornaments are so pretty in those fabrics. I remember that kind of ornament, but I don’t have any, either. I do have some that were from my grandmother’s tree. I’m 73 (tomorrow), so you can guess how old they are! Very creative! You have such neat ideas. Fabrics are neat–can’t pass up Alice! I love your project it is sew beautiful. Thank you for the inspiration. I can’t wait to see all the projects you have been working on. Have a beautiful holiday. I love this fabric. Thanks for the chance to win some! Very pretty! Love the antique ornaments! The name alone —Curious Dream—is so pretty! It’s a great collection and very inspiring with all of the luscious colors! Your ornament project brings back lots of memories! Super work! Wonderfully creative use of this collection! I love it! So creative and beautiful. Love your idea to fussy cute the key details– such a great result! Oh a great looking present for someone. Would love to make some pillow cases also with this beautiful fabric. Your ornaments are darling. Thanks for the chance. Your pillow is so festive and the floss just sets off the ornaments. I collect antique glass ornaments, so your pillow spoke to me. Thank you for a chance to win this lovely collection. Merry Christmas! Your ornaments are delightful! Creating them must be sheer fun! Thanks so much for sharing this. Sweet fabrics. I love the how you made the ornaments. I love what you did with these fabrics! The ornaments are gorgeous and so creative! Love the soft colors. Merry Christmas. LOVE your Tree!! Gorgeous!! Also Love the Pillow! You are sooooo Creative!! The Ornaments look like they came that way… I am soooo impressed! AWESOME!! 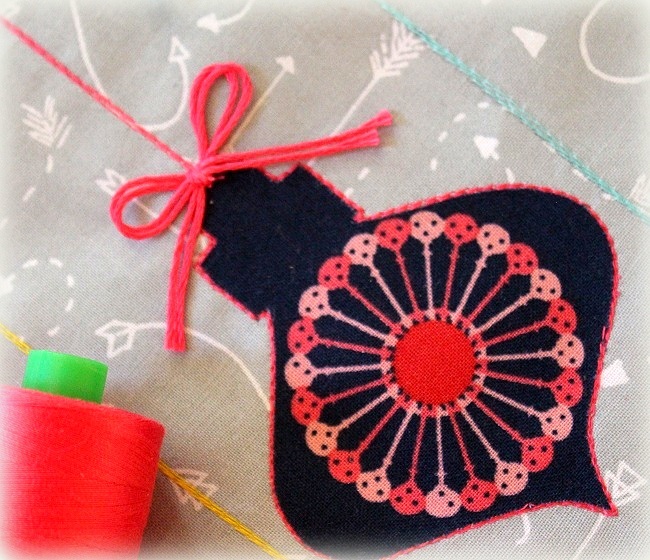 2nd try… Making the great ornament pillow from non-Christmas fabrics is so creative! I don’t have a creative bone in my body, so when people like you, who are so creative, make it possible for people like me to make beautiful things for our friends and family. THANKS!!! Love how you looked at this line in a totally different way. I love your pillow! What an adorable pillow! I love the way you added the ornaments on it. I’m with you…I don’t like the raw edge showing so I either turn the edges under and hand-sew my appliques or do as you did and use a decorative stitch around them. Thanks for the giveaway! I love your give aways…maybe someday, i’ll win. I love the stitching! Your blanket stitching really makes the ornament pop! What a great design to show off those awesome fabrics! Adorable pillow! Thank you for sharing your pillow and your designs. The Christmas tree is so elegant. How creative you are! the pillow is adorable! Your pillow is awesome! Love this fabric! Yes, I remember those ornaments. I think yours are beautiful! Your hanging ornaments are sooooo cute!! I love the vintage vibe! Old world bobble ornaments are also a favorite of mine. Love that you made them out of non traditional fabric. The fabric line looks fun to use. You are so creative! The ornaments are marvelous! Hoping you have time to slow down and enjoy Christmas with that little girl! Is she going to play you a Christmas concert? I always did at my house when I was a kid. In fact I am practicing my Christmas music now, so who knows, maybe it will be ready for Christmas Day! Love love love the pillow with the old world ornaments. Merry Christmas, Wendy. Wishing your and your family a joyous holiday season. How cute! I love the ornament appliqués. Your pictures show off your work so well. I love the fabrics and what you’ve done with them. Just awesome. Oh, these fabrics are just magical! Thanks for the chance!! Just love these fabrics! Thanks for the additional idea for appliquing multiple times around an object instead of button hole stitch. I love the fabric line and what you did with it. 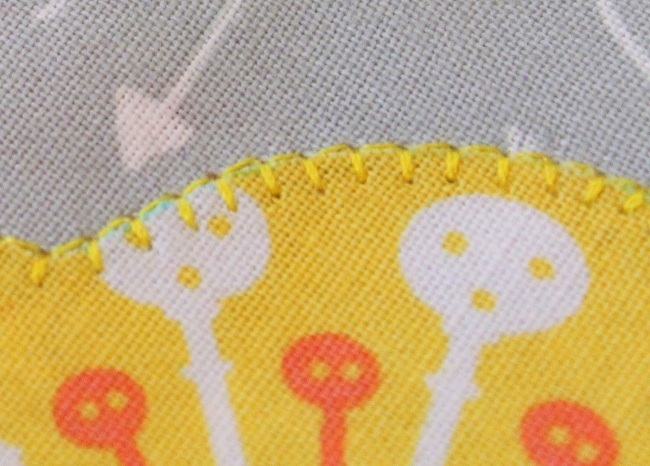 I as well love doing the buttonhole stitch around my applique. I hope I win this! Thanks for a chance to win! That was a phenomenal amount of work that you did! wow. I follow you via email … I also dream of driving and road ends into nothingness. That’s not fun! I left an earlier comment as my #1 comment but it isn’t showing. Thank you very much for the inspiration and giveaway! I like your pillow. The use of non-Christmas fabrics is clever. I really like the colors in the fabric. I remember those old ornaments. We had some when I was a kid. I remember them being quite fragile. What a great idea you created with the ornament pillow. I do not decorate trees anymore for the holidays but I surely decorate my home. I love your choices for the pillowcase! Thank you for sharing and inspiring! Love the fabric line. thanks for the chance to win! The fabric collection is awesome! Great ideas for this fabric line. Thinking outside the box is always so much fun, especially when the results turn out this sweet! Love the pillow. It does look like christmasy! I love what you did with Angela’s fabric! Fussy cutting those ornaments is very cool! Great job! Love all the red on your Christmas tree. What goodies will Santa leave underneath??? No need to apologize for a pastel Christmas pillow. That is what some people need this time of year–softness. The ornaments are very sweet. I prefer a mix of Christmasy and not Christmasy on my tree. Love the prints you used for the ornaments! I especially like the text fabric … and your Christmas idea was a good one! Thanks for the giveaway! Love what you did with the fabric on the pillow. Love the line of fabric. What a lucky girl who has a mom who can create like this! Your Christmas pillow out of Angela’s fabric is gorgeous! Festive, and could be used all year. your pillow is wonderful. you are very creative. Beautiful fresh colors. Thanks for the giveaway! Such cute fabric and I love the way you made it work for a Christmas pillow. Clever. i love the colors in this collection, girly but grownup at the same time. I love the idea of triple stitching around the fused appliqué shapes! 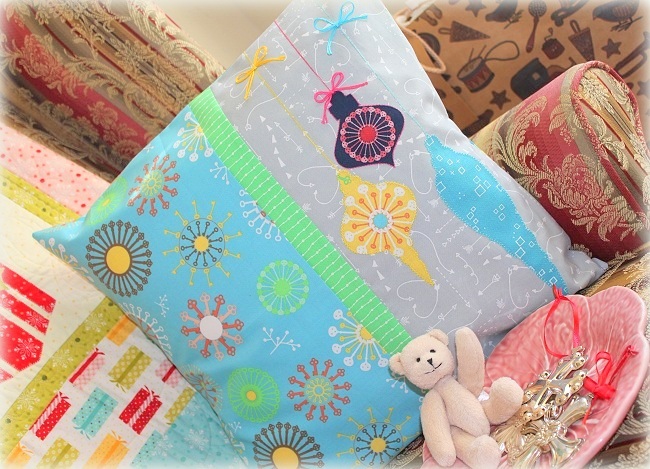 The fabrics in this bundle are so gorgeous! I love how the stitching made the ornaments stand out. You made vintage brand new again!! The fabrics in Curious Dream are so lovely. Your stitching is beautiful. Your handwork has inspired me to give the embroidery floss a try. I LOVED those ornaments too. I still have a couple of them – very high on the tree. You did an amazing job recreating them. The detail on the pillow with the ornaments is perfect. Merry Christmas to you and your family. 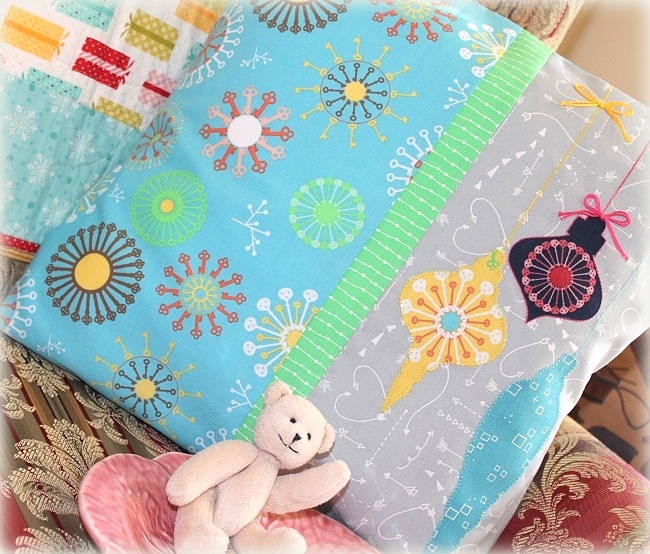 Love the applique and the thread details on your pillow! Wendy, I can’t believe how ingenious you are! Making ornaments out of the one fabric is absolutely the most creative idea I have seen! It makes me realize I need to spend more time really studying fabrics. There is so much more there than first meets the eye. Merry Christmas! Wendy, the idea to fussy cut the fabric to enhance the ornaments is great! The extra stitching around the edges adds so much to the project! Great job and creative ideas! Your ornaments are a great way to use these fabrics! Old World blown glass bauble Christmas ornaments: I had quite a few of them at one time. My son decided to show them to his then girlfriend (now his wife) and took them down from the attic. Only he didn’t make sure the bottom was secure. They bounced all over the hall because the bottom of the box broke open on the way down. Ornaments from my Dad’s early years, mine, all shattered!! I still remind him when the opportunity arises ~ lol. Think I will look for this fabric and replicate the memories. Thanks Wendy. Merry Christmas and healthy, happy New Year to you and your family!! beautiful fabrics, and I love the pillow !! Love the beautiful fabrics. They would make a wonderful quilt. Love all the fabrics! Me and my husband love quilting together! Love your ornaments! Merry Christmas to you and your family. Your pillow is gorgeous! I love your stitching around the ornaments, especially the blue one!! Your tree is beautiful! Love the pillow.